Wedged between two buildings in Rua de Santa Justa and Largo do Carmo is a Lisbon elevator that has become a tourist attraction. 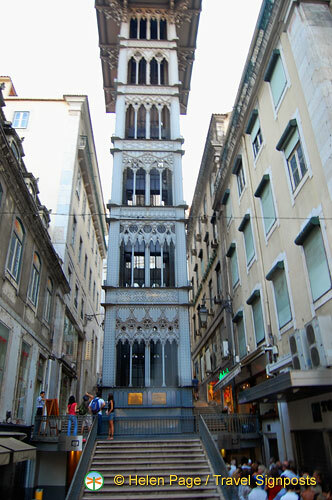 The Elevador de Santa Justa, one of the eccentric sights of the Baixa district, has been classified as a National Monument since 2002. The Santa Justa elevator was designed by Raul Mesnier de Ponsard and completed in 1902. Born in Porto, to French parents, Raul Ponsard was an apprentice of Gustave Eiffel. When he returned to Lisbon he petitioned the royal house to provide funding for his grand idea. Originally powered by steam, it must have been a sight to watch this elevator work during its early days. In 1907, this Lisbon lift was converted to an electrical operation. The Santa Justa lift is 45 metres tall and made of iron and decorated with filigree. Up to 20 passengers at a time can travel up and down in each of its two smart lift cages. The cabins are wood-panelled and have brass fittings. There is a cafe at the very top. At the top, at 32 metres above ground, there is a walkway that links the elevator with Largo do Carmo in the Bairro Alto. At the very top of the tower there is a cafe which affords magnificent views of the Baixa neighbourhood, the Rossio Square, Lisbon Castle and the river. To get to the cafe, one climbs a spiral staircase. The ticket office for the Elevador de Santa Justa is located behind the tower on the steps up to Rua do Carmo.